Value of card: Soto? More like so low. Mario Soto was not angry in the above photo. He was just straining all of his head and face muscles under the weight of all that hair. Mario Soto did, in fact, refuse to call his undershirt in this picture a "turtleneck." He instead called it an "afrosweater." 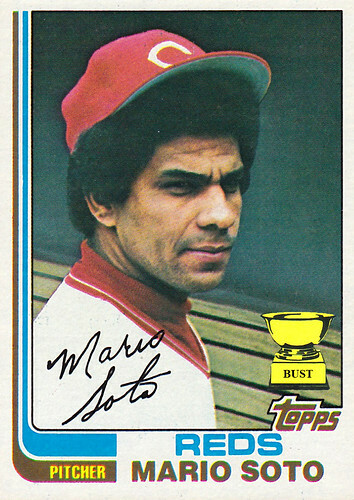 Mario Soto did not use bobby pins to keep his hat atop his head. He used Superglue. Mario Soto did not have a family of robins living in his hair. It was just a single robin who was afraid of commitment. Mario Soto did, in fact, use his afro to once catch a line drive. He also used it to catch taxis, trout, the attention of ladies and, one time, the clap.